• A stable careers programme. • Learning from career and labour market information. • Addressing the needs of each student. 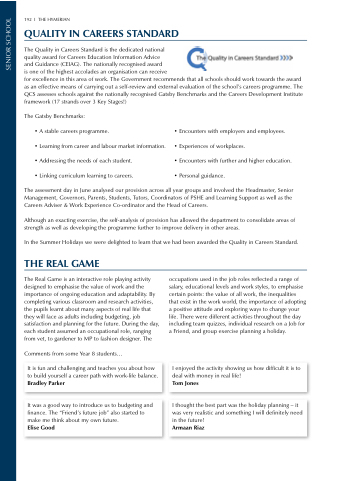 • Linking curriculum learning to careers. • Encounters with employers and employees. • Encounters with further and higher education. • Personal guidance. The assessment day in June analysed our provision across all year groups and involved the Headmaster, Senior Management, Governors, Parents, Students, Tutors, Coordinators of PSHE and Learning Support as well as the Careers Adviser & Work Experience Co-ordinator and the Head of Careers. Although an exacting exercise, the self-analysis of provision has allowed the department to consolidate areas of strength as well as developing the programme further to improve delivery in other areas. In the Summer Holidays we were delighted to learn that we had been awarded the Quality in Careers Standard. occupations used in the job roles reflected a range of salary, educational levels and work styles, to emphasise certain points: the value of all work, the inequalities that exist in the work world, the importance of adopting a positive attitude and exploring ways to change your life. There were different activities throughout the day including team quizzes, individual research on a Job for a Friend, and group exercise planning a holiday. I enjoyed the activity showing us how difficult it is to deal with money in real life! It was a good way to introduce us to budgeting and finance. The “Friend’s future job” also started to make me think about my own future. I thought the best part was the holiday planning – it was very realistic and something I will definitely need in the future!